Have you ever been traveling through our fair City and spotted a street sign askew, a sagging power line, a stray dog in the roadway, a crack in a sidewalk, or noticed a pothole and thought, “I wonder if someone’s going to take care of this?” but didn’t have a clue who to call to report the issue? There’s an app for that! The City of Jeffersonville’s “YourGOV” application which can be found on the front page of the City’s website and through your smartphone’s app store (search for YourGOV) and it allows you to report these matters directly to the appropriate City department. Cindy Seifert, who administers the program through the City’s Wastewater Department says, “This is my baby. It’s amazing how when you get in contact with the right people – how quickly things can get done!” The YourGOV app stemmed from an asset management program which allows the City to monitor everything from when a particular sewer line was last replaced to when a City vehicle had its last oil change. The YourGOV app has been in place since November 2011, and Cindy says about 200 citizen-reported issues have been resolved during that time. But that number could be higher, and Cindy wants to get the word out to more citizens about this useful resource. 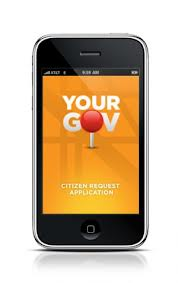 “The City of Jeffersonville’s YourGOV app is a wonderful asset for both our citizens and our government. It allows communication to flow freely in both directions so our City can be more responsive to our citizens’ needs, and for our citizens to know that their concerns are being addressed in real time, ” said Jeffersonville Mayor Mike Moore. “It’s great for our citizens to have direct contact with us, and even better that we’re able to respond quickly,” said Seifert.